A Preliminary energy analysis study. Minimum standard of building improvements to reduce utility costs and provide for the most efficient use of the conditioning equipment. The existing structure, lighting, mechanical equipment, and operating controls shall exceed Title 24 requirements by 25%. 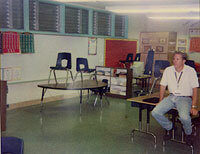 Minimum outside air for indoor air quality requirements is mandated at 15 CFM per person during the period of classroom occupancy. Air conditioning equipment to be designed and constructed to meet SDG&E incentive criteria, and California Energy Commission approved Equipment Standards. Recommended efficiency requirements are items which the District believes will result in energy savings beyond the basic building construction in the installation of air conditiong systems. Research and analysis of lighting and mechanical equipment for existing and new building additions. Analysis of mechanical equipment performance and their efficiencies verifying design criteria and set points for compliance with California Title 24 regulations.